From Hino Matsuri Illustrations Artbook. Oh my gosh *--* i'm gonna put this in my notebook >_> maybe they call me childish and some of them are gonna have a nosebleeding (muahahaha) thanks n.n! wonderful! I love Kaname with Zero covers! seems they are always in pain! thanks so much! 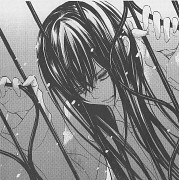 zero... ur a fool to suffer so much for her... just grab her n run! Two of the most handsome guys in VK *_* Of course i loved it! beautiful! would anybody vector this? :D or clean up the words? i'd be grateful! Yay it's clean. Thank you so much for sharing! Thank you soo much for giving us such a beautiful and touching scan. It's amazing! By the way, do you have Yuuki's part, too? Yes! thanks for a bigger version, I had this really small one, that was hard to vector. Wow! 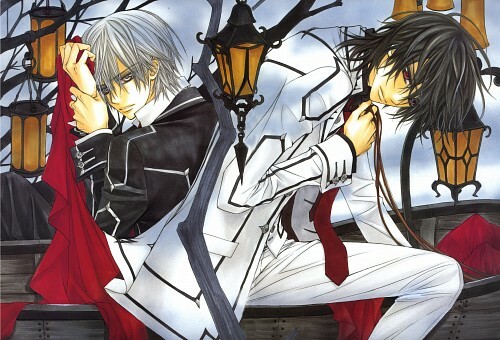 Very beautiful scan of Kaname and Zero! I love the colors too! Thanks for sharing! super, super, my lovely serie!